As surely as rain falls, a new Picross arrives from Jupiter – bringing more fresh puzzles to the Nintendo Switch! 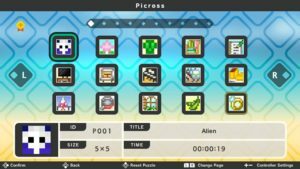 In this review, we take a look at how Picross S2 renews a legacy of addictive and phenomenal puzzle-solving fun! Just like previous entries in the Picross series, players have to use number hints around a grid to construct images. Gameplay is like a bizarre version of minesweeper – the numbers indicate which blocks of a row or column should be filled in, and which ones should be left empty. For example, the hint “3 3 2” on a row represents: (from left to right) one group of 3 blocks, one group of 3 blocks, and one group of 2 blocks. While this can be a little confusing for newcomers, Picross S2 does include tutorials that cover the basics. 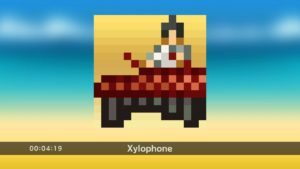 By the time you master Picross puzzles, you’ll feel like you’ve learnt a new language! These puzzles get harder and harder by adding more rows and columns – eventually leading up to 20-by-15 grids, which are pure madness to complete. It should also be noted that a “Mega Picross” mode remixes normal Picross puzzles with a different hint system. This means the game actually features 300 unique puzzles to solve! Puzzles can also be paused and continued later – which makes the game perfect when you’re waiting for your commute. Whether I was lying in bed or travelling to work, I found myself killing a lot of time with Picross S2. The game does come with a 2-player option, with each player using a single joy-con. Teaming up to solve puzzles can make for a fun night with your loved ones. New puzzles are not the only great thing about Picross S2, however. 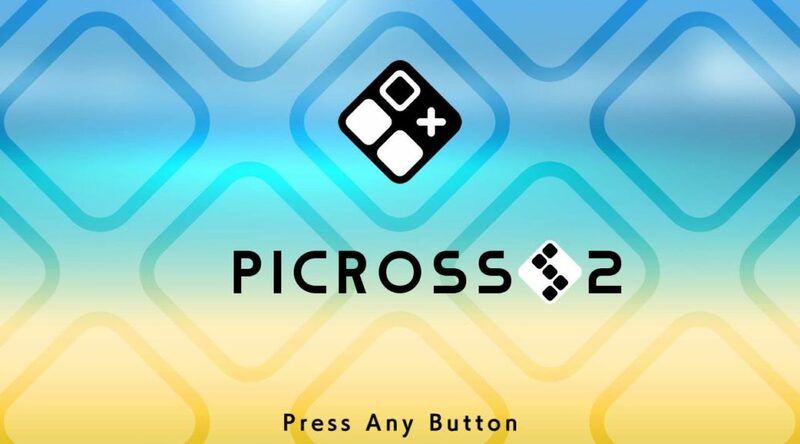 Older fans of Picross will recall ‘Micross’ – where they had to complete smaller puzzles to form a massive portrait. Each of these puzzles offered a unique challenge – often taking over an hour to complete! Picross S2 repackages this experience as “Clip Picross” – which features five portraits to solve! However, there are some differences between Clip Picross and Micross. 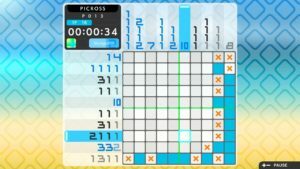 While Micross puzzles of the past could be completed in one sitting, most Clip Picross puzzles are locked at the start. 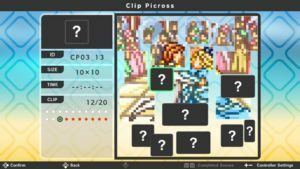 To unlock Clip Picross puzzles, players will have to play normal Picross puzzles first. This keeps the game feeling fresh, as players are encouraged to swap back-and-forth between normal Picross and Clip Picross. Like a buffet, you’ll feel like you’re enjoying a little bit of everything slowly. Overall, the return of these larger puzzles adds even more value to Picross S2. The full price tag of USD 8.99 is definitely worth the hours of calm joy you will experience! 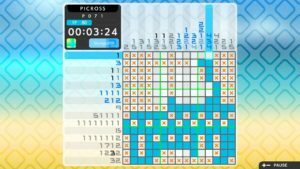 While Picross S2 may look simple and somewhat plain – the game’s visual presentation is nothing to scoff at. Completed puzzles almost appear to spring to life as they fill up with color on the Nintendo Switch’s screen! This is accompanied by a calm soundtrack in the background – which oozes a soothing charm. Those looking for something to unwind with on a quiet night will not be disappointed. If there was a way to package positive vibes in a jar, this game comes pretty close. Picross S2 is very much worth the price of entry. Players will find themselves losing hours to the challenges within – as they get sucked in to play ‘one more’ puzzle. This beautiful game is great for passing the time while commuting, on a quiet night, or even with a second player. Of course, Picross S2 will not be a perfect fit for everyone. It can take awhile for newcomers to learn how the puzzles work, and some may not appreciate the game’s simple presentation. However, those looking to expand their mind will most likely get hooked on the series. There’s a good reason why Picross games are still being made today. Can be difficult for newcomers at first. Visual presentation can be too simple for some. Soup Verdict: It’s Chicken Soup for the MIND!